The IELTS Speaking test is surrounded by several myths. Let us now bust some of them and make you aware of the mistakes you shouldn’t be committing during the Speaking test. The IELTS Speaking test is scored equally (25%) on the basis of fluency, grammar, pronunciation and vocabulary. To begin with, as has been mentioned earlier, hesitations or silence in between speech lowers down your score in terms of fluency, thus affecting your overall score. Repeating the same words in the same order is another way in which you will lose some significant marks in the IELTS Speaking test. For example, if the examiner asks you, “What is your favourite colour?”. Answering the question with “I love the colour yellow…” is a way better method to score rather than saying “My favourite colour is yellow…”, which is lower your marks. So remember to rephrase the question and answer in your own words. Examiners have enough experience to differentiate between memorized and authentic answers. So make sure you don’t learn a format for answering every question and let your natural speech flow. You are there to answer the questions for your test, not the examiner, so do not him/his for their opinion. For example, if asked a question, you cannot say “I don’t know the answer to this, what do you think?” You will lose marks. In case you do not know an answer, you can simply say, “I’m afraid I know nothing about this topic.” If you haven’t understood a particular question, you can always ask the examiner to rephrase the question, especially in the third section. 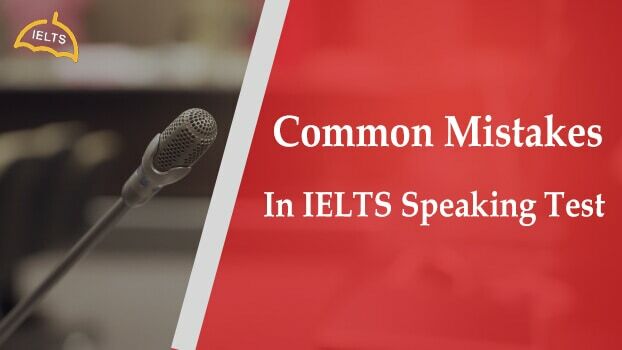 Remember that quite unlike the Writing test, the IELTS Speaking test is an informal test of English, and thus, using a formal language will affect your score. For example, using words like “firstly”, ”on the other hand”, ”I do not”, etc. should be avoided. Additionally, try using contractions whenever possible, to get more marks in the Speaking test. For example, “My name’s XYZ”, “Well, it’s quite interesting a perspective”, etc. It is important that coherence, i.e., relationship between the question and the answer is maintained. In other words, do not go away from the topic of the question. Keep your answers to a moderate length, i.e., not too long or too short and answer the question that is asked, not outside it. For example, if the question is “What is your hometown like?”, do not start with your hometown and go on to talk about your village head for 2 minutes straight. While speaking during the test, make sure you are at a medium pace, pronouncing each sound correctly and modulating your voice according to the words making up in a sentence. The IELTS examiner will not expect you to speak in a British or American accent, but will definitely look into the pronunciation of the 44 English sounds that you make. So, the correct pronunciation is important. Secondly, keeping a flat tone, without any rise or fall in tone, makes a speech very unintelligible, i.e., difficult to understand, so make sure that you are emphasizing the important words in the sentence. For example, content words. Just because the IELTS Speaking test is an informal test, it doesn’t mean that you can overlook or ignore grammar. Maintaining grammatically is very important. So make sure English grammar comes naturally and spontaneously to you. The idea that overuse or repetition of linking words like ‘also’, ‘but’, ‘like’, ‘because’, etc. leads to reduction of marks is a myth. Linking words are used to connect ideas and no matter how many times you use them, they will not reduce your marks, but just help in making the examiner understand your thoughts better. Your explanation is really good.